Yesterday was a holiday and with holidays come food. Lots of food. And drinks. And chips. And dessert. Holidays used to totally stress me out. There were always foods that I could or could not eat. I was either in control (controlling everything I ate and drank) or out of control (binging and going food crazy). There was really no happy medium. We bbq’d at my house and we had so much food. And I ate it all. I had chips and dip, potato salad, beans, and 2 watermelon margaritas (which by the way are so good). Oh, and cake and chocolate ice cream. And I didn’t stress out about what I was eating, I ate what I wanted, and how much I wanted. It was liberating. It felt like my very own independence day. After being a chronic dieter for so many years and being a pretty regular restrictor and binger, this is huge for me to be able to do this now. To be able to just eat what I want. Normally yesterday I would have binged, felt sick, then felt guilty, then weighed myself today and not eaten to compensate for “being bad”. 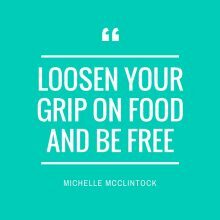 So let me just remind you today to loosen your grip on food. It does not control you. It’s ok. You are ok. You are enough.